Canada's Points System | Six (6) Selection Criteria and Pass Mark - Gateway to Canada | Canada Immigration Consultancy! How can I be eligible using the points system under Federal Skilled Worker (FSW) Program's six (6) selection criteria with only one year experience? That was the question I received from one of the new nurses who passed the June 2009 Nursing Board Licensure Exam Results, who stumbled upon this blog. 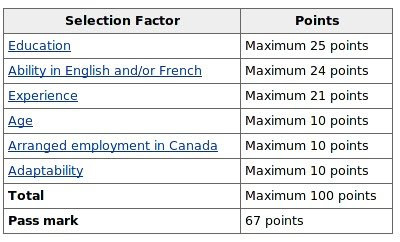 To answer that question, let me explain first Canada's FSW program selection criteria - the points system and the pass mark. Please note that to be eligible under the Federal Skilled Worker Program, you must have at least one year experience in Canada's 38 High Demand Occupations. You may also be eligible under the FSW program sans experience in any high demand occupations if you have an Arranged Employment Opinion. If you are eligible to apply as a skilled worker, you will be assessed on six selection factors and a point system. Now, let's take a look at the specific requirements to establish the exact points you will get depending on your circumstances. For your language ability factor, the maximum you can get is 24 points - English (16 points) and French (8 points). Here's the New IELTS Exam Results Points System. If you know French langauage, then you may also write the Test d’évaluation de français (TEF) administered by The Paris Chamber of Commerce and Industry. You must have at least one continuous year of full-time, paid work experience or the equivalent in part-time continuous employment. Your work experience must be in the category of Skill Type 0 (Management Occupations), or Skill Level A (Occupations usually require university education) or B (Occupations usually require college education or apprenticeship training) on the Canadian National Occupational Classification (NOC). You must have had this experience within the last 10 years. If you have an arranged employment in Canada, you will get additional 10 points. For the age factor, maximum you can get is 10 points if you are between the age bracket, 21-49 years old. For every year below or over the bracket, there will be a 2 points deduction. Under the adaptability factor, you will get additional points (3-5 points) for your spouse education (if accompanying with you). If your spouse is also a University degree holder, you will get additional 4 points. If you, or your accompanying spouse or common-law partner, have a relative (parent, grandparent, child, grandchild, child of a parent, sibling, child of a grandparent, aunt or uncle, or grandchild of a parent, niece or nephew) who is residing in Canada and is a Canadian citizen or permanent resident, you will get additional 5 points. So there. At this point, we already know how the assessment is being done. Now, let me show you how you may qualify even if with only one year experience using the example below. See? With only one year work experience, you may meet the eligibility requirements! I hope to have explained clearly the Points System Six (6) Selection Criteria, but just the same, you may send your resume to aapuntar@go2canada.com for Free Assessment.